Chiffon cakes are not only tall, light, and airy but they are also incredibly rich and tender. The height comes from the whipped egg whites, and the moist crumb is the result of a few egg yolks and vegetable oil. The key to a successful chiffon cake is perfectly whipped egg whites. When beating them, watch as they transform from a pale yellow to delicate white, and become smooth and shiny. When you lift the beater from the bowl they form peaks that yield with gravity. Once you have these beautifully whipped egg whites, make sure they retain air as you incorporate them into the rest of the chiffon cake batter. Chiffon cakes are traditionally baked in a tube pan with removable bottom. It is important to use an un-greased tube pan. Make sure that there is no trace of grease in the pan, or your cake won’t rise. Once baked, the cake should stick to the sides of the pan. When you invert the pan and allow the cake to cool, it won’t fall out of the pan. When ready to ice and serve the cake, simply run a knife along the outside edge of the pan and it will release itself beautifully. Gather the ingredients. Preheat the oven to 325 F.
In a medium bowl stir together the cake flour, sugar, baking powder, and salt. Make a well in the center of the flour mixture. Add the egg yolks, oil, water, 1/4 cup of the lemon juice, and the zest. Beat with an electric mixer at medium speed until smooth. Wash and completely dry the beater before the next step. In another large bowl combine the egg whites and cream of tartar and beat at high speed until very stiff peaks form. Very gently fold the egg whites into the lemon batter in three batches, digging down to the bottom of the bowl and bring the two mixtures up and over one another. Fold the mixtures together just to the point when no white streaks remain. Pour batter into an ungreased 10-inch tube pan with removable bottom. Bake for 65 to 70 minutes or until the cake springs back when lightly touched. If your pan has legs (similar to the pan shown here), invert and allow to cool completely, at least 1 hour. (If your pan does not have legs, invert the pan over a bottle to cool.) Once cooled, run a knife along the outside and carefully remove the cake from the pan. Place on a serving plate. 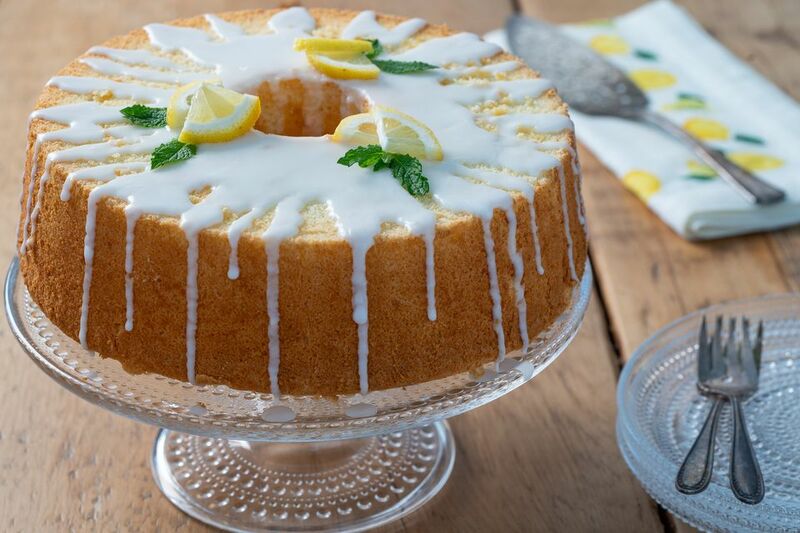 In a small bowl stir together the confectioners’ sugar and fresh lemon juice, one teaspoon at a time, until you have reached desired drizzling consistency. Drizzle the icing over the cake, allowing it to run down the sides of the cake. Garnish with fresh lemon slices and fresh mint, if desired. Serve and enjoy!